Patch 1.1.0 includes general improvements to performance and UI, balance changes, and a new Champion – Destiny, the Sky Ranger. The patch is scheduled for 9:00 AM CET on Wednesday, November 22nd. There will be a downtime of two hours as we prepare the Arena for her arrival. Added additional resolution options for the following aspect ratios: 5:4, 4:3, 3:2, 5:3, 16:10, 16:9, 17:9, 21:9. This should allow players with a struggling GPU to reduce the resolution and thus increase performance. The aspect ratio is currently locked to a minimum of 16:10 – this will be fixed in an upcoming patch. Loadout Picking time reduced from 90 to 60 seconds. A notification message will now appear in chat when Steam Overlay is not enabled when trying to purchase a bundle that requires overlay to be enabled. Can now equip mounts in the Collection -> Mounts window. It should no longer unready all members of a party when one member unreadies. Fixed a bug where black borders would block the HUD when in a match with 4:3 or 5:4 (or higher ratio) resolutions. Fixed overlapping texts in the ‘Active quests’ section in champion select. Added ‘View Profile’ dropdown in the add friend popup. If multiple chest reward notifications are active and player clicks on one, all of them are removed. Added Champion icons to control settings dropdown list. Changing camera modes (bound to 1-4) have been re-enabled in full screen Odeum replays. You should no longer get stuck in the loading screen if you edit a replay directly after viewing an Odeum replay. Champions are now properly cleared of energy, buffs, weapon charges, and other effects before each round starts. Fixed a bug with Shadow Pestilus’ Queens ability. Added a 500 HP dummy that regains health if not attacked for 1.5s. You can practice combos on it! The Dab of Pride and Accomplishment – New Legendary Pose available for Croak. Can be unlocked for 20,000 Tokens. This item can only be purchased with tokens and will not drop in chests. Projectile attack dealing 16 damage. Successful hits reduces the cooldown of Charged Bolt by 1s. Hold to charge a projectile for up to 1.2s to increase damage and distance. The projectile deals 8-32 damage and inflicts Spell Block. Compress yourself into an orb to dispel movement impairing effects and to increase movement speed by 125%. Deals 16 damage and knocks the first enemy you bump into back. Counter the next melee or projectile attack. Countering an attack vaults you into the air and fires a plasma blast that deals 22 damage and knocks enemies back. Deploy a Plasma Wall at target location. The barrier reduces projectile speed and snares enemies that pass through it. Fire a colossal sphere of volatile energies forward towards target position. Firing Power Blaster or Charged Bolt at Mega Sphere causes an explosion, dealing the fired projectile’s effects to all nearby targets along with 14 bonus damage and inflicting Fading Snare to enemies hit. Compress yourself into an orb and dash forward at high speed. Deals 40 damage and throws enemies into the air for 0.6s. Bounces on walls up to a total of three times. Toggle defensive weapon mode, granting a shield that absorbs 6 damage. Blaster deals 6 damage on enemy hit and applies a shield absorbing 10 damage on ally hit. Shields self for the same amount on both enemy and ally hits. Max shield value: 40. Summon a plasma prison at target location that stuns enemies that pass through it. Destiny can be unlocked via the All Champions Pack or purchased for 900 Gems/5800 Battlecoins. Unlocking Destiny with Gems up until December 12th will also grant 3x Destiny Chests. Ownership of Destiny is required to purchase this Chest. Contains three random items. Guarantees at least one Rare Destiny item and one Rare normal item. All Destiny cosmetics can also drop in standard (Silver, Gold, and Legendary) Chests. 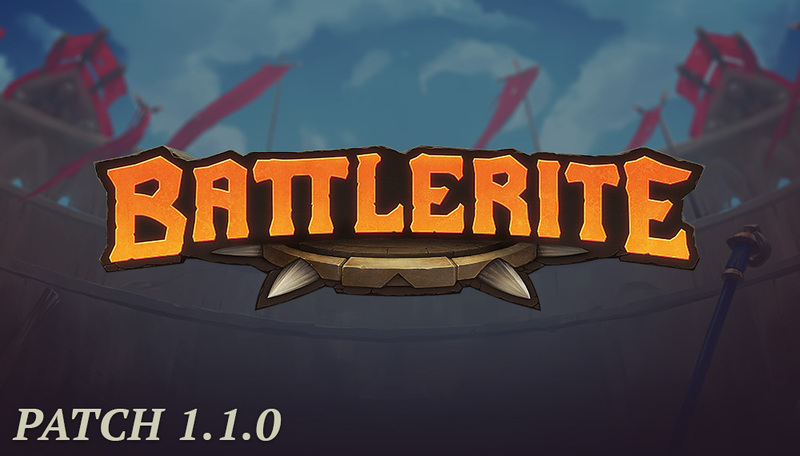 We are continuing to monitor the popularity and viability of the various battlerites going forward. 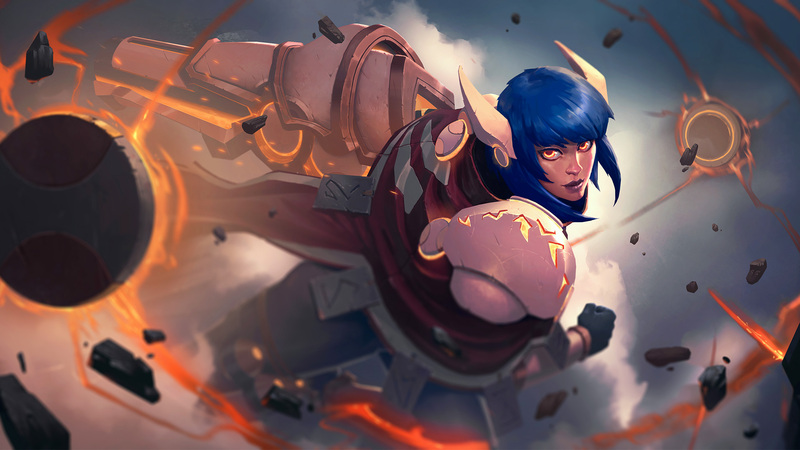 As such, various battlerite changes below are targeted to weaken the effect of the strongest battlerites, while some of the less popular ones gain increased power. The goal is to give each champion multiple options and builds. The high knockback of Dance of the Dryads allows Blossom to string the three hits together against targets without escapes. The knockback change should increase counterplay and make it more difficult to land the second two waves after the first wave hits. Bonus healing reduced from 4 to 2. Now also adds 2 additional healing to Butterflies when placed on allies. Recast changed to a Lesser Hop, which has a range of 4. Regular Hop has a range of 5. Jumong’s last change improved the consistency of his energy gain but it offered too much immediate energy gain. This change smooths out the energy gain over the duration so he is rewarded for picking vulnerable, immobile targets. Energy gain changed. Now grants 4% energy on initial hit and 6% over the rest of the duration. Pearl’s weapon is now Charged at the start of each round. Now only gives a Slicing Winds charge if Heavenly Strike successfully hits a target. Fixed a bug causing Rook to lose the energy gained from Orb if he destroyed it using his ultimate. X-Strike Boomerangs now deal 2 bonus damage in base, and an additional 4 damage where the Boomerangs intersect. Now compatible with Spinning Boomerang, adding 2 bonus damage on the way out and 4 bonus damage on the way in. Now increases base stun duration of X-Strike by 0.2s, and further increases the duration by 0.2s where the Boomerangs intersect. Now compatible with Spinning Boomerang, adding 0.2s to the stun duration on the way in. Thorn is receiving some additional graphical updates to improve the readability on his abilities. Thorn also telegraphs his actions more, offering enemies greater time to react. Effects have been updated to clarify which player casts the ability, and which direction is will be heading.